European startup relayr, founded in January last year and currently based at the StartupBootcamp accelerator, has kicked off a crowdfunding campaign for a hardware kit for developers aimed at making it easier for them to experiment with building apps for the long-promised Internet of Things. Apps that can notify you when someone opens the office beer fridge, for example, or share temperature data as part of a global network of sensors. Relayr’s answer to simplifying the marriage of software apps and discrete hardware sensors that can be located in all sorts of places is a chocolate box of sensors that developers can wirelessly tap into, and integrate into software developed for the Android, iOS or Node.js platforms. It’s calling this kit the WunderBar — the configuration of which has in fact been designed to look like a bar of chocolate, with seven snap-off-able pieces, and (at certain pledge levels) chunky 3D casings for each to make it easier to stick individual sensor modules where you want them. The aim of the WunderBar is to keep things simple by getting rid of the need for app developers to connect sensors via wires. Relayr is also providing libraries, tutorials and examples to help developers start building apps that make use of the data generated by the sensor hardware. The idea is to free software developers to quickly and easily play around with bits of hardware, allowing them to snap off a section of the WunderBar to use its particular sensors in a location where they want to gather data; no soldering mess, no fuss. Bluetooth Low Energy and wi-fi are used to transfer and upload data from the sensor modules, and there are SDKs and an API to make it easier for developers to plug into the WunderBar hardware. Individual sensor modules contain LEDs, buttons and their own battery. The bar’s six “smart modules” currently include sensors to monitor temperature, proximity, light, colour, humidity, and movement. A fourth sensor lets you control a home entertainment system with an infra-red transmitter. The sensors the last two modules will contain will be determined during the crowdfunding campaign by a vote. 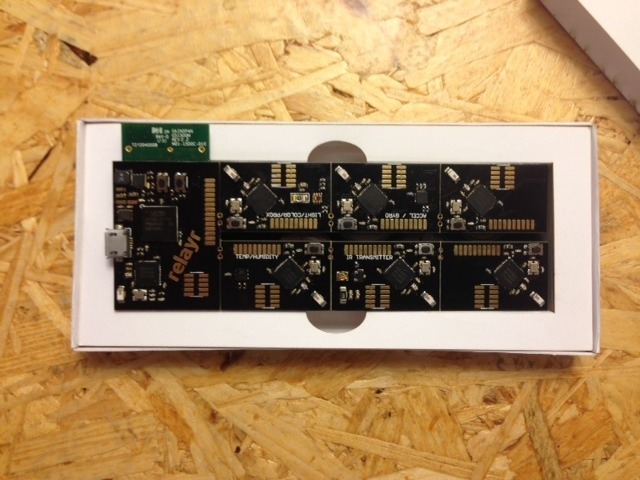 As well as the sensor modules, the WunderBar kit includes a main module with an ARM microprocessor and a Wi-Fi chip, and which talks to the sensor modules via Bluetooth, allowing their data to be relayed from local environmental placement back to relayr’s cloud platform where developers can start playing around with it. The WunderBar isn’t the first hardware sensor starter kit I’ve seen — for instance, there’s the BITalino bio-sensor kit (also from Europe). That kit is aimed at supporting development of medical devices and health tracker apps. But the WunderBar has a less specialist hardware feel, with an eye on helping app developers generally start thinking about how to extend the capabilities and reach of their software with the help of a little extra sensor hardware. “The aim of the WunderBar is for play, experimentation and rapid prototyping,” says Bond. “The WunderBar is not just a bootstrapping product for that, but pretty much embodies how we feel the IoT will grow: by giving developer entrepreneurs access to the right tools to make it easy for them to build the products that we as consumers will want to own. “The hardware startups of today are just a start, given the right tools, bringing products to the IoT market will become comparable to getting an app in the App Store today,” he adds. The WunderBar was priced at $119 for early backers on Dragon Innovation — but the handful of kits at that price have already been snapped up so it’s now $149 or more. The estimated shipping date is May. Relayr has raised 250,000 euro in a friend and family round of funding to date, and is in the process of closing a further 500,000 euro from undisclosed tech investors. It was also pitching for Series A funding in front of 400 investors today, as part of the StartupBootcamp DemoDay.